Orthodontic treatment is a great way to align your teeth, achieving both a pleasing smile and optimal dental function. One of the only disadvantages of orthodontia – especially for adults – is the length of the treatment. The AcceleDent® is an FDA-approved device proven to speed up the movement of your teeth by as much as 50 percent. How Does AcceleDent Speed Up Orthodontic Treatment? This device emits tiny, gentle vibrations, known as micropulses. The micropulses accelerate the changes in your bone that allow your teeth to move (also known as "bone remodeling"). So by speeding up bone remodeling, your teeth move faster and your orthodontic treatment may be shortened. 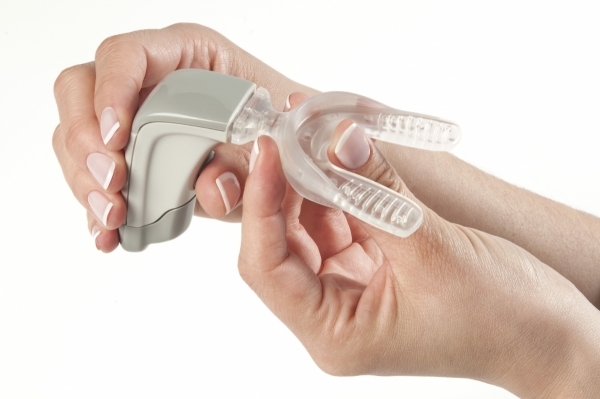 The easy to use, hands-free device fits over your orthodontia. You wear it just 20 minutes a day, every day to speed up tooth movement. It's completely painless and you can choose the 20-minute session whenever it's most convenient – at home at night, while working on your computer or while watching a movie. The AcceleDent device is only available by prescription. Dr. Elisa Mello and Dr. Ramin Tabib can help you decide if you want to use the device, and they can prescribe it to you if you choose to use it. To find out if AcceleDent is a good companion to your orthodontic treatment, please call the experienced dentists at NYC Smile Design, at 212-452-3344. We are proud to serve Manhattan and all of the surrounding areas in New York.